My fiancée and I recently booked a flight and hotel for our honeymoon in early June. When planning our trip, we tossed around the notion of renting a car for the week we would be there. Renting a car can be a fairly simple affair, but is renting a wheelchair van just as easy? I set out to see what all factors into a wheelchair vehicle rental. There are some key differences that set renting a car and a wheelchair van apart. My research turned up 3 key points that everyone looking to rent a wheelchair van should be aware of. It pays to do your homework ahead of time! Rental services understand that you need the vehicle to get where you need to go. Sometimes, that may even include the rental service. Our BraunAbility dealers will rent a wheelchair van to customers to fit their needs and will do whatever it takes to meet those needs. Most will even bring your rental to the airport to pick you up! If you are traveling and need to rent a wheelchair van, find a wheelchair vehicle rental service and call them ahead of time. It may be the most convenient part of your trip! Wheelchair vans are rented for more reasons than vacation travel. Transportation for bigger chairs or multiple people may facilitate the need for different vans for different situations. Depending on your rental location, you have the option to rent either a full-size van or a minivan. Test drives are critical for determining what vehicle is right for you, but what if you want to make sure the vehicle will work perfectly for your day-to-day routine? Rent a wheelchair van! Renting different vehicles may help you truly determine what ramp style, vehicle type, or door height will give you the best results for your daily routine. Our BraunAbility dealers offer wheelchair vehicle rentals for a wide variety of uses. 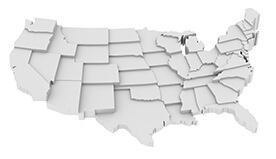 In addition to our dealers, there are wheelchair vehicle rental services located around the country as well. Having your vehicle with you is not always an option. Wheelchair van rentals just may be the right thing to make your travels, business functions, and more, easier. You can find which BraunAbility handicap van dealers offer wheelchair vehicle rentals on our website.